The better alternative to fence and wall toppings. Do not create a cramped in prison feel and has a nice appearance. Spikes/blades are reinforced to penetrate protective fabrics utilised by intruders. VERY UP MARKET. Superb and very, very effective with high tensile steel reinforced band for maximum strength. Very difficult to cut due to lipped sides which pushes pliers out. Longer sharper blades to overcome blanket situation. Allows for vicious cuts and it is very risky to try and penetrate. •	Concertina Coils to be plate-bolted to top of walls at 750mm intervals. Cheaper alternative yet still very effective for residential properties and lower crime industrial areas/properties. To optimise the efficiency of the product it must be installed as a secure unit to supply optimum effectiveness. Razor mesh has been designed as a ‘high’ security free-standing fencing option to protect small-holdings / farms / commercial and industrial properties / airports of the world / borders / warehouse / prisons / mines / military bases / Government institutions, etc. The product is virtually impossible to climb or to be cut with standard tools. The Diamond pattern combined with vertical opposing barbs act as an entrapment yet it still has a very neat appearance. 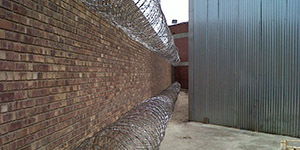 Razor mesh is produced exclusively out of reinforced razor wire product. 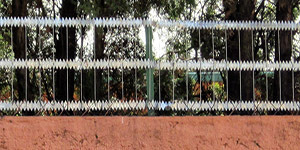 The Ripper blade provides the necessary strength and rigidity which make razor mesh one of the ‘most’ effective security fences / barriers available. •	Straining posts – 90mm steel posts set in 600mm concrete at 30m intervals. •	Straining wire – 3x 3.15mm or 4.0mm dia. thick. •	Fix to straining wire with hog rings. 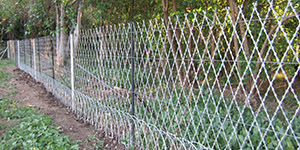 •	Ultimate security as a free-standing fence. •	Razor mesh is also an optimum deterrent if fitted to palisade and pre-cast walling to avoid the breaking out of wall-panels or palisades, as is commonly found on plots and farms commercial and industrial areas. 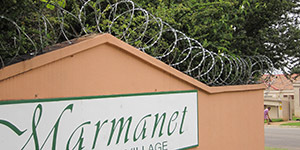 •	Razor mesh is to be fitted to wall and palisades for optimum security. 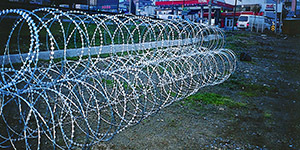 Security barriers have been designed as a free-standing or fixed system. It incorporates coils of razor wire fixed together into pyramid formation. These formidable module barriers can be deployed in long stretches. Can also be purposely put together on site as to clients need and requirements. The barrier can be lifted or dismantled for re-use. Barrier is highly efficient to cordon off dangerous sections in the industrial / private and commercial sectors. Very effective to secure property, people and employees in strike situations. Also used by South-African Police, Military and Government departments on a frequent basis. Ripper coil stacks is a system designed as a fixed option to avoid intruders breaking through ‘pre-cast and brick walling’ and also ‘palisade and diamond mesh fences. Two to three 730mm coils are stacked on top of one another (according to height of wall) and fixed to walls / fences to create a barrier. For town-house complexes and in industrial areas with open dangerous sections of fields where criminals can hide and got time on their hands to gain quick entry. 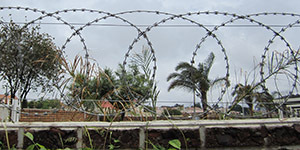 • Coils can be stacked on top of one-another, clipped together and bolted to walls or fix to existing fences. 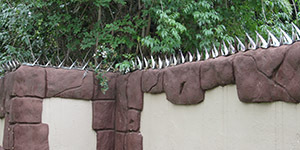 Wall spikes provide a neat yet very effective solution to your security needs. It enhances the appearance of the property and has been proven very popular throughout South-Africa and Europe, especially effective on brick / plastered walls and can be installed to follow wall contours. •	Shark-tooth spike – is made from 2mm thick toughened steel with 100mm extremely sharp spikes and is electro-galvanised in either silver or gold. •	Castle spike – is made from 2mm thick toughened steel with 120mm double row of reinforced spikes and is electro-galvanised in silver.